HALF DAY EXCURSION. VISIT TO A LITTLE TOWN MAINLY COMPOSED OF STONE DWELLINGS WITH CONICAL ROVES AND BUILT WITHOUT ANY MORTAR. TOURS BY BUS. DISTANCE: 60 KM. 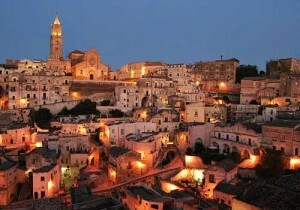 ALBEROBELLO, known as the Capital of the Trulli, is situated on two hills separated by an ancient riverbed. The Eastern hill hosts the modern town and the other hill towards the West is where the “trulli” are to be found. They are clustered together in two quarters: Monti and Aia Piccola, and are both considered National Monuments. The trullo, a building with conical roof made without mortar, is a fascinating architectural feature of this area of Apulia. The history of this unusual town dates back to the second half of the XVI century when, as it was a small fief under the control of the Acquaviva family, the Counts of Conversano, it began to fill up with farmers who made the (so-called) Selva a fruitful land. The Counts authorized the colonists to build dry dwellings, in order to have them easily pulled down in case of royal inspection. As a matter of fact, according to the “Prammatica de Baronibu”, the birth of an urban conglomeration required the payment of a tax. The idea mentioned above allowed them to save this unjust tax. On 27th May 1797, King Ferdinando IV of Bourbons issued a Decree by means of which the small village became free. 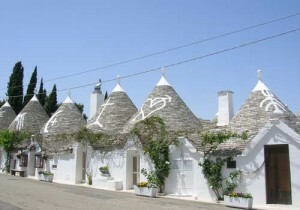 The collection of some 1,500 “trulli” – some of which are still inhabited by the locals as well as used for stores, restaurants and lodging – is unique. For this reason the “Trulli di Alberobello” were inscribed on the UNESCO World Heritage Site in December, 1996. Another important monument to visit in Matera is the Cathedral (1268–1270), a church dedicated to Santa Maria della Bruna since 1389. There are many other churches and monasteries dating back throughout the history of the Christian church. Some are simple caves with a single altar and maybe a fresco, often located on the opposite side of the ravine. Some are complex cave networks with large underground chambers, thought to have been used for meditation by the rupestral and coenobitic monks. GROTTAGLIE – The name Grottaglie derives from the Latin Cryptae Aliae, meaning “many ravines”, which has been inhabited since the Palaeolithic Age. The ancestral part of Grottaglie was one of the citadels in the area, referred to in Medieval documents as Casale Cryptalerum, founded during the Dark Ages by the inhabitants of the caves who sheltered there due to Saracen invasions. The fief of Grottaglie was donated by the Norman overlords to the archbishopric of Taranto in the 11th century. In the 14th century the ecclesiastic administration provided the fief with fortifications, walls, a castle (Castello Episcopio, Italian for “archbishop’s castle”) as well as with the Chiesa Madre (“Mother church”). Grapes and ceramics-industry are two traditional elements of the local economy since the times of Greater Greece. The numerous ceramic finds, tracing back to the Classical Age and kept in the National Museum of “Magna Grecia” in Taranto, reveal the antique roots of this handicrafts production which was privileged by the presence of clays in the surrounding territory. 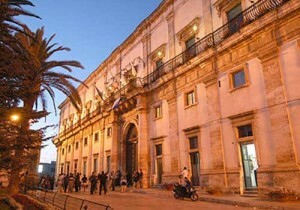 MARTINA FRANCA – In the highest part of the Murge, between Taranto and Brindisi, lies one of the most characteristic towns of the Puglia region: Martina Franca. The old town has the greatest tourist appeal, with its fabulous and completely intact baroque buildings. Martina Franca has a unique setting, dominating the Valle d’Itria, known as the Valley of the Trulli with its vineyards, small groups of picturesque white houses, dry stone walls and open countryside. The climate adds to the appeal, and, due to its position 400 meters above sea level, a wonderfully mild temperature throughout the summer months is guaranteed. The architecture of the historic part of town is charming with small white houses, narrow lanes, wrought iron balconies covered in flowers, Palazzi and Churches, and monuments including the gateway Porta di St. Antonio, the Arch of St Stefano, Palazzo Ducale and the Collegiata of St Martino. BARI (ancestral, Barium) was an important Roman colony and a commercial centre in the II century BC. But its greatest importance dates back to 852 B.C. – when it became the seat of the Saracen power – and to 885 B.C. – when it became the residence of the Byzantine governor. In 1071 it was conquered by Robert Guiscard and this was the town where Peter the Hermit supported the First Crusade in 1095. In the XIV century it became an independent duchy and in 1558 it was given to Philip II of Spain and Naples by Bona Sforza. – the Svevo Castle (Norman-Hohenstaufen Castle), built in 1132 by the founder of the Kingdom of Sicily, the Norman king Ruggero II, and reinforced in 1233. 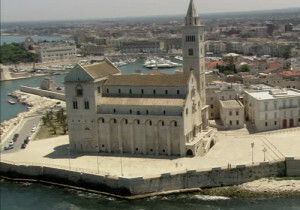 TRANI, Turenum of the ancient Roman, was later occupied by the Lombards and the Byzantines. First certain news of an urban settlement in Trani, however, trace back only to the 9th century and its most flourishing age was the 11th century. Emperor Frederick II built a massive castle in Trani. Under his rule, in the early 13th century, the city reached its highest point of richness and prosperity. 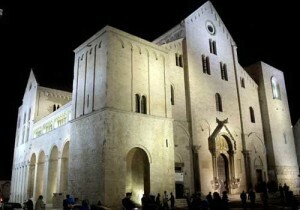 The main monument of Trani is the Cathedral, famous over Italy, which was consecrated before its completion, in 1143. It is a basilica with three apses, built in the characteristic white local limestone. It has also a large crypt and a lofty tower, the latter erected in 1230-1239. CASTEL DEL MONTE, named a World Heritage Site by UNESCO in 1996, is a fortress with an octagonal prism and octagonal bastion at each corner. Each wall has 8 rooms and an eight-sided courtyard occupies its centre. The octagon is thought to be an intermediate symbol between a square (representing the earth) and a circle (representing the sky). Frederick II may have been inspired to build to this shape by either the Dome of the Rock in Jerusalem, which he had seen whilst on Crusade, or by the Palace Chapel of Aachen Cathedral. 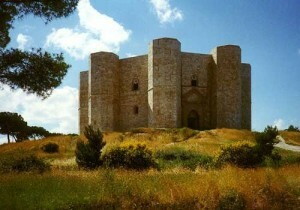 It was completed in 1249 and was used primarily as a hunting lodge by Frederick until his death in 1250. It was later turned into a prison, used as a refuge during a plague, and finally fell into disrepair. It originally had marble walls and columns, but all were stripped by vandals. Pompei is a unique witness of the everyday life of the past. The city has re-emerged from the darkness of centuries just as it would have been when it was unexpectedly buried in the eruption of Vesuvius. It was the year 79 A.D. Although the vastness of the tragedy was appalling, the thick layer of volcanic material which submerged Pompei has meant that the city has remained intact up to the present day, and provides an absolutely fascinating picture of “daily” life. The walls of the houses are covered with electoral propaganda messages or risque jokes aimed at particular citizens. The signs on the shop doorways indicate the activity carried out there or the name of the owner. Alongside the elegant villas belonging to the nobility were the luxurious residences of the middle class, whereas modest houses such as the peasant dwellings are situated around vegetable gardens or small plots of land. On the edge of the city were the brothels. They were intended as places of pleasure for sailors and travellers passing through. In the narrow alleys, the workshops and utility rooms provide further evidence of the daily routine performed by workmen and slaves as well as the women of the house. The houses still contain furniture, ornaments, gold and silverware, work tools, kitchenware, bronze and terracotta lamps, foodstuffs of all kinds, counters for serving drinks, grain mills and grindstones, workshops for manufacturing cloth, smithies and outlets selling groceries, fruit and vegetables. There is a remarkable record of Roman painting, of which, without the finds made in Pompeii, virtually nothing would be known. 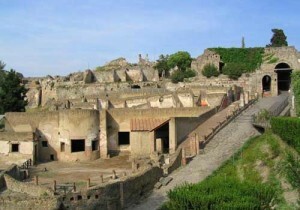 The archaeological areas of Pompei, Herculaneum and Torre Annunziata were named a World Heritage Site by UNESCO in 1997.